The magic of turning your stories into meaningful & memorable visual stories. > it's proven that you retain, remember and recall information 80% times better than just from looking at text or listening. If you want someone to remember your content for longer and actually learn something - tell a story. What better way then creating pictorial representation of speakers' talks and taking your audience on a journey. Pictures add an element to storytelling that text can't: speed. Visuals are processed by our brains 60,000 times faster than text. What does it mean in practice? You can get your audience to buy into your message much faster with an engaging picture. It's actual science - can't beat the facts. It's an innovative solution for recording information, so graphic facilitation can also be called: graphic recording, live sketching, speed drawing, scribing, sketch notes. > want to boost your event's engagement and visibility? How about adding some creativity and making your event more memorable? (we all know how many are out there!) Graphic facilitation is the answer. Your social media impressions and engagement can increase massively and so is the buzz around your event. Speakers retweet and love their talks drawn, sponsors will appreciate a visual around their support rather than just haing their logo placed on a board, audience will interact online with your event more and spread the word thus making it more visible and you will get useful content to use after the conference for blogs, updates and next year promotion. KEY BENEFITS OF DIGITAL: more and more of our clients are going for the digital graphic recording which we deliver on tablets. Think a person in the room, all we need is access to power and wifi and off we go. 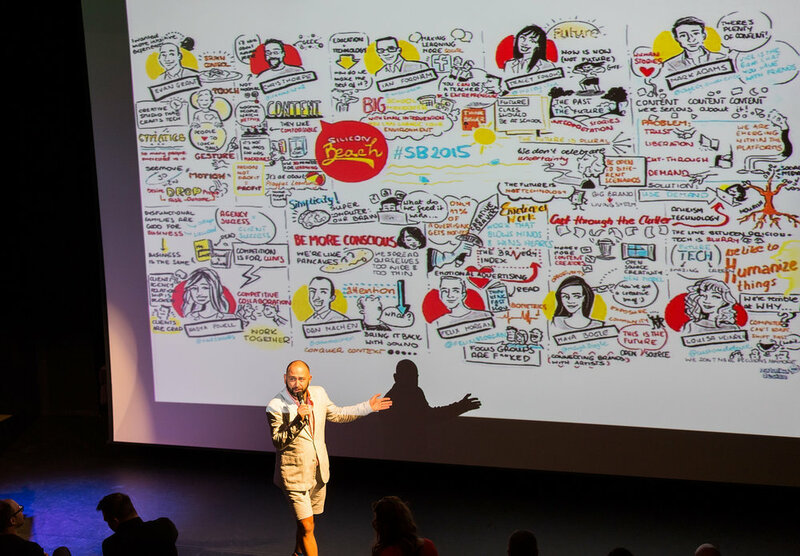 We can show what's been drawn wether throughout the event on a screen or just in breaks to boost the engagement and make it work as a conversation starter. Digital pictures are easy to tweak and edit, print in any size shape or form for your guests after the event and look very crips on the screens if you're thinking to share the visual on a blog, website, send through newsletter or email. It's fast, looks great and easy to share instatnly online. > be creative and let your audience remember your meeting, event, conference or pitch differently!